YAY it's October! That means sweaters, boots, all things pumpkin, and HALLOWEEN! Halloween is one of my favorite holidays. Before I had kiddos, I loved dressing up, going to themed parties, and even catching the Rocky Horror Picture Show live on stage in Atlanta. Those days are long behind me and now we have more kid-friendly festivities. And I'm TOTALLY okay with that! Besides dressing the kiddos up in their super cute costumes, we love to go to our local pumpkin patch, enjoy some hayrides, carving pumpkins, indulge in too much candy, and watch Netflix for all of our spooky (the kid friendly way) streaming. Curious George: A Halloween Boo Fest - Get ready for a spook-tacular good time with Curious George - in his first-ever Halloween movie. This fun-filled adventure is a bewitching treat for the whole family! Children's Favorites: Halloween Treats - Angelina Ballerina™, Bob the Builder™, Barney™, Rubbadubbers™, Kipper™, and Pingu™ are all having a delightfully, frightful time in these kid friendly Halloween stories. Room on the Broom - To the annoyance of her cat a kindly witch allows a dog, a bird and a frog who have helped her retrieve things she has lost to ride on her broomstick, making it top heavy. The broom is destroyed by a fire-breathing dragon who threatens to eat the witch but the creatures band together to impersonate a monster and save her. As a result she fashions a luxurious new broom with seats on which they can all ride comfortably. 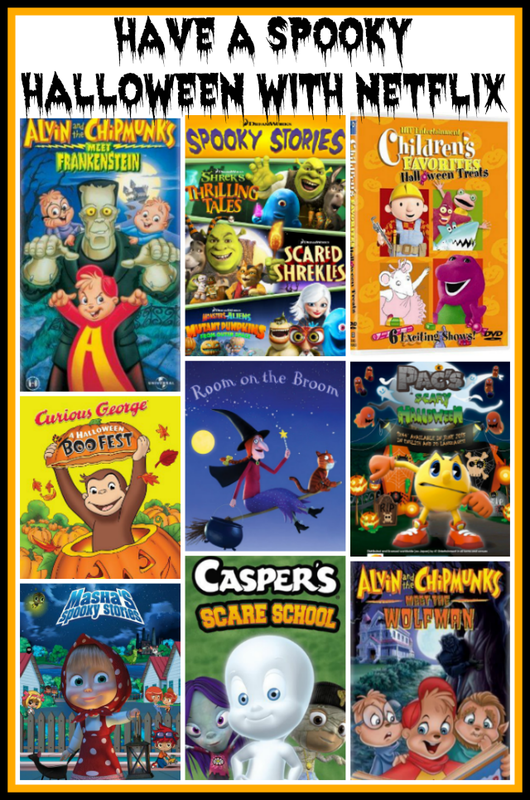 DreamWorks Spooky Stories and Volume 2 - In these spooktacular stories, your favorite DreamWorks characters from the blockbuster hits Shrek and Monsters vs. Aliens return in these chilling tales for the whole family. Alvin and the Chipmunks Meet Frankenstein - While the Chipmunks are working at the amusement park, Majestic Movie Studios, in a singing attraction. Little do they know that the real Dr. Frankenstein are in a new attraction called, "Frankenstein's Castle". After Alvin drives a crazy bus ride, they miss their next performance and get locked in the park after closing time. Dr. Frankenstein figures that the castle isn't scary enough and re-creates the real Frankenstein and after the monster finds the boys, it starts a wild and wacky adventure! Alvin and the Chipmunks Meet the Wolfman - It's the Chipmunks' third and final full-length feature! Alvin is struggling with nightmares of werewolves. Alvin believes that the new next-door neighbor Mr. Talbot is a werewolf. Of course, no one believes him. Meanwhile, the boys are working on the school production of Dr. Jekyll & Mr. Hyde. When Alvin blows up the school auditorium, he is expelled from the production. Theodore is put in to rise his lack of confidence. Alvin and Simon are trying to discover the secret of Mr. Talbot. Will the play go as planned or will the Chipmunks mess it up?! And is Mr. Talbot a werewolf? Masha's Spooky Stories - Spin off of Masha and the Bear which is a Russian animated television series loosely based in the oral children's folk story of the same name. The show focuses on the adventures of a little girl named Masha and a fatherly pictured bear that always keeps her from disasters. Mickey's House of Villains - The villains from the popular animated Disney films are gathered at the House of Mouse with plans to take over. Soon, the villains take over the house and kick out Mickey, Donald and Goofy. It's all up to Mickey and his friends to overthrow evil and return the House of Mouse to normal--or as close to normal as it get's. Casper's Scare School - Casper returns but he can't hang out with his human friend and the scare school assigns him to scare the humans, even his friend. Halloween may only be one day of the year, but with Netflix's ultimate guide to streams and screams, there’s enough spooky titles and inspiration to get you in the Halloween spirit all month long. Here is a great list that Netflix has compiled for kids of all ages. Whether you’re in need of costume inspiration or delightfully frightful titles to add to your watch list, there’s something to sink your teeth into each day this October. So how will your family be gearing up for Halloween? So many awesome ones! We love the Witch's broomstick and the Dreamworks Scary Stories! 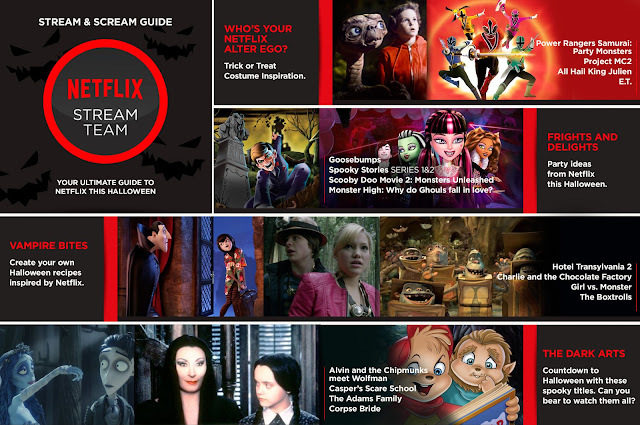 These are such awesome Netflix Kids Halloween shows. I have Netflix and it is fun to watch so many spooky shows. My nephew and niece come over and love watching these fun shows. These shows are perfect for the halloween season! My niece loves curious George and watched Boofest a lot during Halloween. I'm glad there are non-scary Halloween movies for young children. We love these movies, will definitely check them out this Halloween.